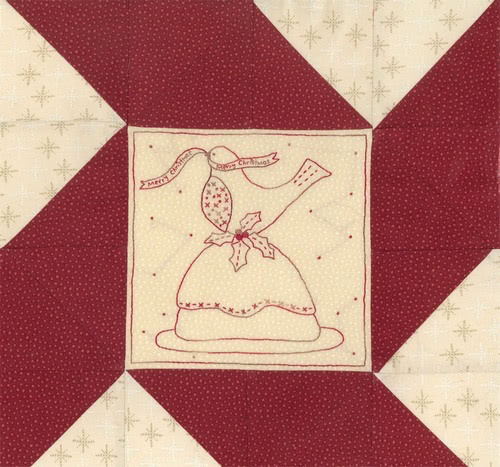 It’s week 11 of our Celebrate Christmas Quilt-Along. Just one more week after this one. I hope you are enjoying our quilt-along as much as I am. Be sure to check out the Flickr group to see the super cute blocks that have been made so far. Block 31, Merry Christmas, has been designed by Lynette Anderson. The Fat Quarter Shop also has a fabulous 50% off Super Deal for you to enjoy too. Fat Quarter Shop is the online quilt store with the best and widest selection of yardage, fat quarter bundles, specialty cuts, quilt kits and patterns. We also offer access to many wonderful quilt clubs, block-of-the-month programs and exclusive projects. Most of all, we pride ourselves in our top-notch customer service, with friendly, knowledgeable representatives and speedy same-day shipping. Our user-friendly web site makes it easy to find the collection, designer and even the theme you are seeking. 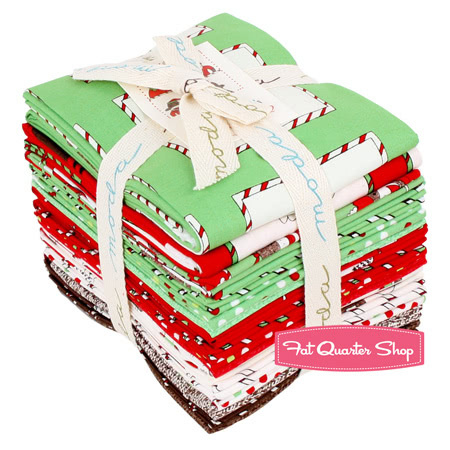 Fat Quarter Shop has all you need for your next project, so start shopping with us today! 50% Off Santa’s Little Helpers by Erin Michael for Moda Fabrics. Enter code HELPERS at checkout. Expires Monday, November 28th @ midnight CST. Get your Super Deal Savings here! What is your quilting style? My quilting style has been described as sophisticated naïve. I love to combine applique with simple piecing and stitchery to create unique looking projects that are suitable for all level of quilter. I like to have some dimension in my work and often include one of my specially designed handpainted buttons. 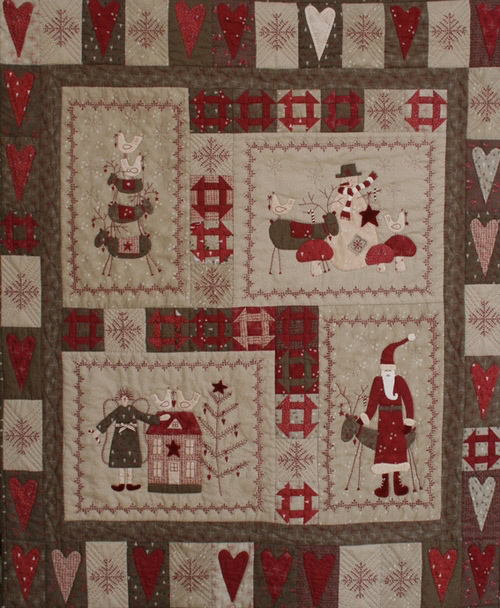 Christmas Fun, the patterns for this sweet quilt pattern are free with the purchase of the buttons (available at my online store). How did you get started quilting and/or designing? 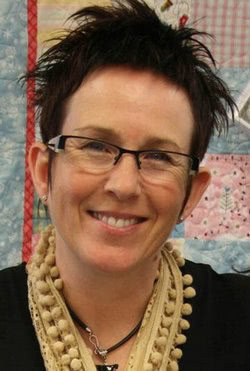 I started quilting when I was 21 just after the birth of my first son, I went to adult education night school classes and made my first sampler quilt and although I have tried many other crafts I always come back to patchwork, quilting and embroidery. I began designing and publishing patterns and books in 1995 and love every moment of my working day, except maybe the pattern writing bit and that’s only because I am worried I will make a mistake. I have been lucky enough to design fabrics for Marcus brothers, Henry Glass Fabrics and am currently working with Lecien with whom I have released 3 collections so far and have a few in the pipeline for 2012 (very exciting). Do you have a favourite quilt? One of my favourite quilts is A Kittens Tale (seen here with my beloved companions Hugo and Felix who are helping me with the binding!). Scandinavian Christmas is also a big favourite and its been very exciting to see the fabric collection of the same name showing up on so many blogs around the world, thank you everyone for your support and encouragement. What part of the quilting process do you like the most? Picking the fabrics and thread colours ready to begin a new project. 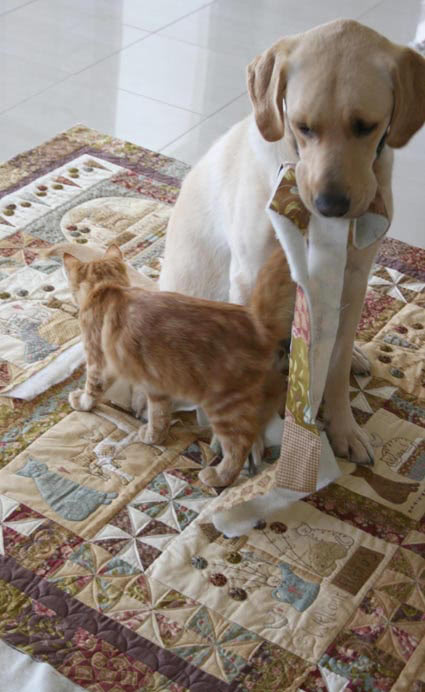 What part of the quilting process do you dislike the most? Sewing the label on when I feel as if I have already finished. Here’s Lynette’s Christmas Candy block. Head over to Lynette’s blog to download the tutorial and for a coupon code to save on her designs. Upload your completed blocks to our Flickr group for a chance to win some adorable buttons from Button Mad – Incomparable Buttons. One winner for each of our quilt-along blocks will be randomly chosen. 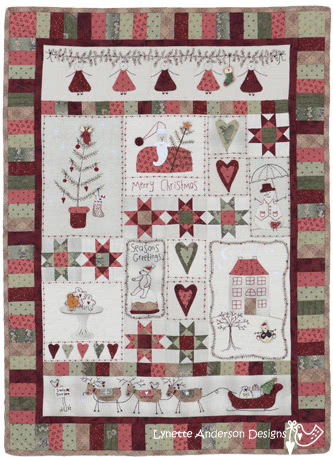 You have two weeks to complete Lynette’s Merry Christmas block to be eligible to win. Please share the Quilt-Along graphic on your own blog. The more participants, the more FUN!